The Zayed Future Energy Prize will today become the Zayed Sustainability Prize as part of a strategic move to refocus its mandate. After ten years of successfully promoting renewable energy initiatives across the globe, the Prize will now broaden its focus to affect greater humanitarian impact by supporting a wider range of solutions to the challenges of sustainable development. Commenting on the Prize’s transformation, His Excellency Dr. Sultan Ahmed Al Jaber, UAE Minister of State and Director General of the Zayed Sustainability Prize, said: “Inspired by the vision and legacy of our founding father, Sheikh Zayed bin Sultan Al Nahyan, the Zayed Future Energy Prize has, for the last decade, been able to positively impact 307 million lives through empowering access to energy, clean water, education, training, advocacy and more. Based on its renewed mission, the Prize now has five distinct categories for applicants to choose from: Health, Food, Energy, Water and Global High Schools. These pillars are interconnected and representative of basic needs essential to human survival where innovations will yield progress in sustainable development. “The Zayed Sustainability Prize will also look to inspire today’s youth to be forward-thinkers and cultivate within them a vested interest in becoming agents of change for sustainable development – after all, youth of today are leaders of tomorrow. Beyond that, we look to recognise existing innovations and amplify their reach so that they may benefit more people and bring us closer to helping solve some of humanity’s biggest challenges,” Dr. Lamya added. 17 January 2018: Congratulations to the nine winners of the 2018 Zayed Future Energy Prize, the latest awardees to join the prize’s growing international community of winners and recognised for their pioneering and innovative achievements or project proposals that further the proliferation of renewable energy and sustainability. Shuji Nakamura, Professor of Materials and Electrical & Computer Engineering at the University of California, Santa Barbara, received the Prize’s Lifetime Achievement award for pioneering the development of white LED lights, an innovation that will have reduced electricity consumption in the US by an estimated 348TWh by 2027, saving more than US$30 billion. Google won the Large Corporation Award. In 2016, Google marked 10 years of operating as a carbon neutral company and announced that it’ll reach 100% renewable energy for its global operations in 2017. Sunna Design won the prize in the Small and Medium Enterprise (SME) category. Sunna Design conceives, manufactures and retails smart solar street lighting particularly adapted to emerging-market environments. Its lamps use a nickel-metal hydride (NiMH) battery chemistry that is resilient to low and high temperatures and has a 10-year lifetime, making it well-suited to remote places with extreme climates. The company has installed about 10,000 lamps in 40 countries working with local partners. Its products are widespread across Africa, parts of the Middle East and India. In the Non-Profit Organisation (NPO) category the SELCO Foundation won the prize. The philosophy of SELCO Foundation is that decentralized renewable energy solutions need to be implemented holistically by combining technology, finance and social aspects to demonstrate the link between environmental sustainability and poverty alleviation. Interventions of the organization leads to improved quality of life and increased incomes for the poor: with the underlying aim to create processes that can be replicated around the world for 3 billion poor people. The five winners in the Global High Schools category are: The Aouda Saadia School for the Africa region; The Bahrain Bayan School for the Asia region; Mbaracayú Educational Centre for the Americas; Vladimir Nazor school for Europe; and Huonville High School, Motufoua Secondary School (MSS) in Tuvalu for the Oceania region. 3 January 2018: The Zayed Future Energy Prize turns ten year. The new logo reflects our past, our present, and our resolve to make tangible differences in creating a sustainable future; inspired by the leadership of Sheikh Zayed Bin Sultan Al Nahyan. The Jury of the Zayed Future Energy Prize convened to deliberate and select nine winners across its five categories today. The winners will be announced at the Prize awards ceremony on 15 January 2018 as part of Abu Dhabi Sustainability Week (ADSW). 16 January 2017: His Highness Sheikh Mohammed bin Zayed Al Nahyan presented the Zayed Future Energy Prize 2017 to nine winners during the 2017 awards ceremony in Abu Dhabi. Nine pioneers in renewable energy and sustainability across five categories became the latest awardees to join the prize’s growing international community of winners. The 2017 recipients of the prize span a wide range of industry expertise, from breakthrough photovoltaic manufacturing to government policy advisory. The Zayed Future Energy Prize has so far recognised 57 individuals and organisations since it was founded in 2008. Li Junfeng, Director General of China’s National Center of Climate Strategy Research, won the Lifetime Achievement award for his unwavering commitment to the adoption of renewable energy in China. In a career spanning more than 30 years, Mr. Li has been instrumental in advancing the country’s renewable energy policies, which have spurred record levels of clean energy investment in China. General Electric (GE) won the Large Corporation award for leadership in the wind and solar energy markets. GE’s wind business alone has commissioned 41.3 GW of total generating capacity and installed more than 30,000 wind turbines to date. Sonnen, the German smart home and commercial energy storage system manufacturer, was awarded the prize in the Small and Medium Enterprise (SME) category for leadership in providing battery storage technology solutions. In the Non-Profit Organisation (NPO) category, UK-based Practical Action was recognised for its work in providing deprived communities with clean energy in Africa, Asia and Latin America. Joining them were the winners in the Global High Schools category, five schools spanning five regions of the globe. Since its inception, the Zayed Future Energy Prize has received over 10,000 nominations and submissions from more than 100 countries. In 2016 alone, the prize received a record 1,676 entries from 103 different nations, a 22 per cent increase on the previous record set the year before. Now in its ninth cycle, the Zayed Future Energy Prize continues to empower winners that are delivering significant impact across the world. These winners are providing the means for women to be social entrepreneurs delivering sustainable solutions in South-East Asia, for communities to be given new, sustainable, ways to receive and use electricity in Europe, for cities in Asia and Africa to be reshaped around new sustainable-transport innovations, and for people and communities to have a voice in shaping sustainable energy policies across the globe. In 2012, the Global High Schools category was launched as part of the UAE leadership’s commitment to the Sustainable Energy for All (SEforAll) initiative and educating future generations about sustainability. Completing its fifth year, the category has empowered 24 schools to incorporate renewable energy and sustainability into their schools and curricula. 20 January 2016: Congratulations to the 2016 winners of the Zayed Future Energy Prize. The winners of the Zayed Future Energy Prize 2016 were announced during the awards ceremony on January 18, 2016. BYD Company Ltd. was founded in 1995 in Shenzhen, China, by Wang Chuanfu. It is the world’s largest rechargeable battery supplier and new energy vehicle manufacturer. Off Grid Electric (OGE) is the world’s first massively scalable off-grid electric company. OGE provides clean, affordable and transformative energy directly to households that have never had access to reliable electricity. Kopernik delivers sustainable energy technologies to last mile communities to reduce poverty. As of October 2015, Kopernik has distributed more than 60,000 units of clean energy technologies including solar lights, solar home systems, water filters, and clean cookstoves, reaching over 300,000 people. 20 January 2015: Congratulations to the 2015 winners of the Zayed Future Energy Prize. The winners of the Zayed Future Energy Prize 2015 were announced during the awards ceremony on January 19, 2015. The Life Time Achievement Award: Former Vice President, Co-founder and Chairman of Generation Investment Management. Panasonic Corporation is one of the largest electronics manufacturers in the world, comprising over 634 companies that make and market a wide range of products under the Panasonic brand. M-KOPA Solar is the market leader in ‘pay-as-you-go’ energy services for off-grid customers – combining mobile payments with GSM sensor technology to enable the leasing of solar power systems. MyShelter Foundation is a non-stock, social enterprise that aims to create affordable and replicable technologies to empower grassroots entrepreneurs to generate wealth through sustainable solutions to move out of poverty. Through capacity building programs and entrepreneurial blueprints, the organization focuses on unconventional thinking for looking for applicable technologies that unleash the capacity of the less privileged to create income while improving the welfare of their communities. Munro Academy provides positively life changing education for Pre-Primary to Grade 12 students. Located in the heart of scenic Cape Breton Island on Canada’s east coast, Munro Academy distinctives include transformative global service opportunities, small class sizes and integration of Christian world-view. Petru Rares National College was founded 145 years ago and many of its original buildings are deemed to be part of the national heritage. The school wants to use this project to replace out-dated lighting and building insulation with more efficient materials and products and to add clean energy generating systems, including PV and technology that can convert kinetic energy to electricity. The school also wants to raise public awareness of energy and resource efficiency. Waterford Kamhlaba United World College of Southern Africa is a remarkable and pioneering secondary school based in Mbabane, Swaziland. For more than 50 years it has provided exceptional opportunities for academic achievement, personal growth and leadership development for students from across southern Africa and beyond. Addu High School installed a 2.8kW demonstration solar project in 2014 using funds from United Nations Development Programme/ Global Environment Facility Small Grants Programme. Melbourne Girls’ College was established in 1994 with the aim of providing an exemplary environment for the education of girls. Since then it has grown in student numbers – a four fold increase since 1994 – and in its reputation. The college is known for academic excellence, commitment to sustainability. 22 January 2014: Congratulations to the 2014 winners of the Zayed Future Energy Prize. The winners of the Zayed Future Energy Prize 2014 were announced during the awards ceremony on January 20, 2014. Life Time Achievement Award: Mr Wang Chuan-fu is the founder, chairman, executive director and president of the China-based BYD Co Ltd.
ABB is a global leader in power and automation technologies. ABB’s solutions help utilities and industries around the world to improve operating performance while saving energy and lowering environmental impact. With a staff of 1,300, Fraunhofer ISE is the largest solar energy research institute in Europe. The work at the institute ranges from the investigation of scientific and technological fundamentals for solar energy applications, through the development of production technology and prototypes, to the construction of demonstration systems. Abellon CleanEnergy is a for-profit company founded in 2008 by Aditya Handa. Its principal activity is the manufacture and sale of biomass pellets made from agricultural and sawmill residues. The agricultural residues are sourced from local farmers, in partnership with Poornakumbha, an NGO established by Abellon in 2008. Bronx Design & Construction Academy (BDCA) is home to the first approved public school green roof in New York City. The ninth grade Ecology class and after-school Green Science Club use the green roof to investigate and develop environmentally sustainable practices. One of four high schools in a small town about 150 miles from Bucharest, the school’s historic main building was built in 1846 and is protected. The schools, Maula and Sanga, are located in rural northern Malawi, a poor region without a municipal electricity grid. Its inhabitants spend a high proportion of their income on paraffin and torch batteries. Due to their lack of familiarity with renewable technologies and concerns about its maintenance, local people are still reluctant to invest in solar power. Kalkeri-Sangeet-Vidyalaya (Kalkeri-Music-School) empowers children from socio-economically disadvantaged backgrounds to realise their full potential for a better life. This is done through a comprehensive academic and music program undertaken in a peaceful rural residential setting in Karnataka, India. Tonga high school has an on-going recycling programme and has been involved in national competitions about climate change and renewable energy. 17 January 2013: Congratulations to the 2013 winners of the Zayed Future Energy Prize. The winners of the Zayed Future Energy Prize 2013 were announced during the awards ceremony on January 15, 2013. Siemens history in the Middle East dates back to 1856, when Werner von Siemens first travelled to the region to supervise the laying of the undersea cables for the London-Calcutta telegraphic line. Since then, Siemens has been at the forefront of contributing to the rapid transformation of the region’s infrastructure. Ceres is an independent, non-profit advocacy organisation that mobilises investor and business leadership to build a low-carbon, clean energy global economy. In 1997, Ceres launched the Global Reporting Initiative (GRI), now the international standard for corporate sustainability reporting. A for-profit social enterprise, d.light manufactures and distributes solar lighting and power products targeting the 2.6 billion people globally without access to reliable electricity. Technical High school 120 is located in a 10,000 m2 terrain at the Mexico Cuernavaca high road, sited at the Guarda Parres community; the school has seven buildings with 10 classrooms (a multipurpose and a TICs) and two workshops. Okehampton College is a large comprehensive school with 1,350 pupils drawn from one of the largest UK catchment areas.. As well as providing a solid academic grounding for its pupils, offers 80 extra-curricular activities for students and place great emphasis on sustainability and the need to become responsible global citizens. Kirya is a secondary school in Kilimanjaro region, Tanzania. It shares a green network with sister schools, Makomu and Kileo. Shaikh Khalifa Bin Zayed Bangladesh Islamia School, Abu Dhabi, was established in 1980 and caters to classes between KG and Grade XII. 18 January 2012: His Highness General Sheikh Mohammed bin Zayed Al Nahyan, Crown Prince of Abu Dhabi and Deputy Supreme Commander of the UAE Armed Forces, presented the prestigious 2012 Zayed Future Energy Prize to 3 winners and 2 runners up at the awards ceremony held in Emirates Palace. The Zayed Future Energy Prize 2012 was awarded in the Small and Medium Enterprises (SMEs) & Non-Governmental Organizations (NGOs) category to the UK’s Carbon Disclosure Project whilst India’s Orb Energy and Environmental Defence Fund of the US were first and second runners-up respectively in the same category. 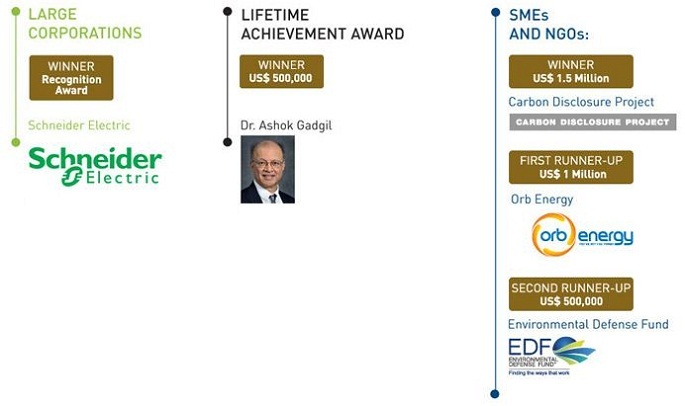 Dr Ashok Gadgil from the US won the Lifetime Achievement award while French company Schneider Electric received a Recognition Award in the Large Corporations category. 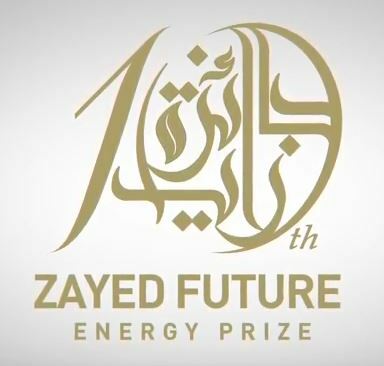 25 May 2011: The Zayed Future Energy Prize announced three new categories for the 2012 competition and increased the total prize fund to $4 million. The new categories for the Zayed Future Energy Prize are: SMEs & NGOs, Lifetime Achievement for an Individual and Large Corporations. To increase the size and breadth of the prize, organizers conducted independent surveys that led to changes in the 2012 competition, specifically 1) increasing the total prize fund from $2.2m to$4m; 2) adding three new awards in the SME-NGO category; 3) initiating a new recognition prize for large corporations; and 4) developing a new international education competition for high schools, reflecting a major focus on education. Submissions will be judged on four main criteria: Impact; Long-Term Vision; Leadership and Innovation, and in each specific category, on the following criteria: SMEs and NGOs will be awarded three prizes: $1.5m to the overall winner; $1m to the first runner-up; and $500,000 to the second runner-up, for making a clear impact in the field, either through disseminating a particular solution, or through furthering knowledge, awareness, policy development or technology. Large Corporations will receive a special recognition award for a clear vision for the long-term future of energy, and a coherent, sustainable strategy for its own role in this future. The Lifetime Achievement prize of $500,000 will honour an individual for an outstanding record of achievement from academic, political, technological, business or other fields in renewable energy and sustainability. Nominations for the Zayed Future Energy Prize 2012 will be accepted through August 22. Submissions through September 19. Winners will be announced January 17, 2012, in an Award ceremony in Abu Dhabi during the World Future Energy Summit (WFES). 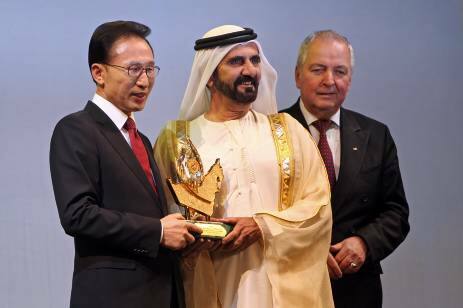 March 2011: South Korean President Lee Myung-bak Receives Zayed Prize For Global Environmental Leadership. Named after the late UAE President Sheikh Zayed, the $1 million Zayed Environmental prize is awarded biannually to political leaders, scientists, and activists who are leading the way in sustainable initiatives. Najib Saab, the Editor-in-Chief of the magazine Al-Bia Wal-Tanmia (Environment and Development) received one of the prizes awarded this year for raising the Middle East’s environmental awareness. The top prize went to South Korea’s President for his country’s “Green Growth” initiative. 18 february 2010: The Zayed Future Energy Prize 2011, worth $1.5 million, was awarded to the Danish wind energy giant Vestas. The company, which recorded record losses last year, presumably could use the cash, but its chief executive, Ditlev Engel, promptly gave it away. Half of the prize goes to a new “trust mark” called WindMade, which is aimed at highlighting products made with wind energy. Its goal is to drive adoption of wind power by harnessing consumer sentiment. 27 december 2010: Six finalists have been selected the last 40 nominees for the 2011 Zayed Future Energy Prize. The winner – to be announced on 18th January 2011 during the World Future Energy Summit (WFES) in Abu Dhabi – will receive $1.5 million. Amory B. Lovins, the Chairman and Chief Scientist of the Rocky Mountain Institute in Colorado, for his work on “integrative design” for energy efficient buildings. Lovins describes “integrative design” as a powerful and globally applicable new tool for shifting rapidly from oil and coal to efficiency and renewables. Barefoot College, the only fully solar electrified College in India, for training woman in rural areas to contribute to solar energy development. The college believes the very poor have every right to have access to, control, and manage and own the most sophisticated of technologies to improve their own lives. E+Co, an investment company based in New Jersey, for its pioneering clean energy investments in the developing world. E+Co supports and invests in small and growing clean energy enterprises in developing countries impact climate change and energy poverty. First Solar, solar modules manufacturer based in Arizona, for its commitment to solar energy and the development of more efficient thin film solar modules. First Solar has developed an innovative photovoltaic technology focused on affordability as well as sustainability and is the preferred module supplier for major PV projects globally. Terry Tamminen, CEO and Founder of 7th Generation Advisors, for his work in developing renewable energy solutions in California. For more than 20 years, Tamminen has developed, implemented and replicated effective renewable and sustainable energy solutions by using California as a proof-of-concept model, then scaling up to larger markets within the US and internationally. The Zayed Future Energy Prize has seen a 30% year-on-year increase in the final number of submissions for the 2011 global competition. A total of 391 official submissions from the world of renewable and sustainable energy have entered to compete for the US$2.2 million prize fund, which will be awarded in January 2011 at the World Future Energy Summit in Abu Dhabi. An additional 959 third-party nominations have been received, identifying individuals and organisations to be considered by the Selection Committee. In all, 69 nations will be represented in the 2011 competition. The prize for the winning design of UAE Land Art Generator Initiative’s (LAGI) first international design competition will be sponsored by Masdar, Abu Dhabi’s multi-faceted initiative advancing the development, commercialization and deployment of renewable and alternative energy technologies and solutions. The winning team will be awarded the prize at the 2011 World Future Energy Summit in Abu Dhabi. The award ceremony will take place as part of the Land Art Generator exhibition at Masdar stand at WFES. 14 december 2010: Entries from 13 nations have been selected for their contribution to sustainable and renewable energy solutions. The top 40 entries were selected from a total of 391 submissions. The winner, to be announced on 18th January 2011 at an awards ceremony during the World Future Energy Summit (WFES) in Abu Dhabi, will receive US$1.5 million. In addition, two other finalists will receive up to US$350,000 each for work in the field of renewable and sustainable energy. 29 augustus 2010: Zo, de volgende editie van de Zayed Future Energy Prize staat weer op het programma. Tot 1 oktober 2010 kunt u weer meedoen en uw project indienen voor de Zayed Future Energy Prize 2011. De totale prijzenpot is met 2,2 miljoen dollar goed gevuld. De hoofdprijs van 1,5 miljoen dollar gaat naar de grootste ontwikkeling in de schone energiesector. De twee andere finalisten ontvangen ieder 350.000 dollar. De winnaar wordt bekend gemaakt op 18 januari 2011 tijdens de volgende World Future Energy Summit. 21 janauri 2010: Toyota is de winnaar geworden van de Zayed Future Energy Prize 2010 voor het verniewende werk dat men heeft verricht voor met name de derde generatie Prius. The Prius was selected from over 300 entries and was awarded the Zayed Future Energy Prize 2010 in Abu Dhabi by H.H. General Sheikh Mohamed bin Zayed Al Nahyan, Abu Dhabi Crown Prince and Deputy Supreme Commander of the UAE Armed Forces. Toyota was presented with the grand prize of USD1.5 million, while two runners up – Zhengrong Shi, Founder ’&’ CEO of Suntech Power Holdings Co. Ltd, China and Amitabha Sadangi, CEO of International Development Enterprises India (IDEI) – were also awarded USD350,000 each. All three finalists exuded the qualities associated with the Prize criteria, leadership, innovation and long-term vision, and are true ambassadors of renewable energy innovation. 30 januari 2008: Al eerder schreef ik over het Masdar Initiative en de wijze waarop men in de Verenigde Arabische Emiraten sinds kort stevig inzet op duurzame energie. Alweer met goed nieuws van het Masdar Initiative over duurzame energie. Er komt een jaarlijkse Zayed Future Energy Prize waarmee initiatiefnemers voor schone energie een zetje in de rug krijgen. De in te dienen projecten en ideeën moeten betrekking hebben op één van de vijf aangegeven onderwerpen: Renewable and sustainable energy – Efficient use of traditional sources of energy – Conservation – Sustainable energy policy – Communication and public awareness. We houden u op de hoogte en vooral over wanneer en hoe u een plan kunt indienen. Wat al wel bekend is dat de competitie open staat voor organisaties en dat u in hoogst eigen persoon ook kunt deelnemen. Vanaf eind april kunt u inzenden en de eerste finale is in 2009. Als ik Rene Prop was dan zou ik even heel snel die drijvende energiecentrale rond de evenaar als plan indienen. Maakt volgens mij goede kans om te winnen. Announced at the outset of the World Future Energy Summit in Abu Dhabi this week, Toyota said it will use the $1.5 million prize fund to establish a scholarship program for 10 students at the Masdar Institute of Science and Technology, located at the heart of the home-grown research and development community at Masdar City in Abu Dhabi. The UAE’s Founding Father, Sheikh Zayed Bin Sultan Al Nahyan, understood the vital link between sustainability and development.